It’s as if hockey scouts have learned nothing from Tyler Johnson, Johnny Gaudreau and Viktor Arvidsson. As much as we’d like to believe that NHL teams have moved past the size bias that often dominates the draft – the evidence would suggest otherwise. Johnson went undrafted, Arvidsson and Gaudreau were selected in the fourth round – all have led their NHL team in scoring at least once in the past three seasons. “But scouts are learning” – are they? Ten months ago, one of the most prolific goal scorers in junior hockey history wasn’t drafted until the second round. Alex DeBrincat fell to Chicago at 39th overall for one reason – he’s 5’7. That brings us to Kailer Yamamoto. Listed at 5’8, 159lbs, Yamamoto is small – very small – a fact that is very obviously affecting his placement on draft lists. He’s ranked anywhere from 15 to 45 (his rankings average out to 19 on the Canucks Army consolidated draft rankings), despite having the type of skill that vastly overshadows most of his peers. Here’s the thing about Kailer Yamamoto’s size – it doesn’t matter. Yamamoto is that elite offensive talent, and possesses the skills that every NHL team could use in their top-6. He is elusive and dangerous every time he has the puck on his stick. He has incredible puck-handling skills and can do things with the puck at top speeds that many can’t. To go along with his puck skills, Yamamoto has the vision and high-end passing ability that had many labeling him as a playmaker after his 2015-16 season in Spokane – then he proved he can be so much more. 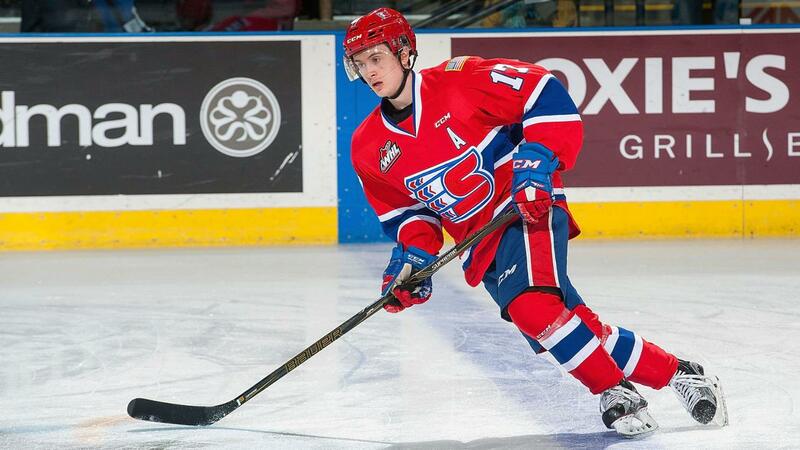 He’s got a quick and powerful shot that made him one of the best goal scorers in the WHL this year. His 42 goals in 65 games equaled his total for his previous two seasons combined. His skating ability is outstanding. His quick, powerful strides give him the explosiveness to create space between himself and his opponent. In a league that thrives on powerplay production, Kailer Yamamoto’s ability to create offense at even strength is at the top of the draft class. His 0.43 points per game at 5v5 is higher than both Nolan Patrick and Nico Hischier – and third behind only Owen Tippett and Jonah Gadjovich among draft eligible CHLers. It’s often said that teams want size down the middle. Being smaller than his peers has not stopped Yamamoto from playing center in the WHL. With that said, his positional development is likely to mirror that of Mitch Marner’s – he can play center but has also played on both wings for Spokane and is likely to settle in as a winger at the NHL level. He has the talent of a top-5 prospect and yet some scouting services don’t even have him ranked in the first round. Maybe it’s not a size bias, maybe scouts are seeing red flags in his game – it’s possible, but I doubt it. The best example of the size bias comes when you compare Yamamoto to fellow WHL prospect Michael Rasumussen. Both players had very productive seasons. Despite having his season cut short due to injury, Rasmussen scored 32 goals and finished with the same 0.65 G/GP as Yamamoto – but that’s where the similarities end. When you look at the 5v5 stats of the two players, there is no comparison – Yamamoto was a significantly better player than Rasmussen. Looking at the above figure, you wouldn’t expect the player in orange to be the higher ranked prospect – that is until you remember that Michael Rasmussen is nine inches an 45lbs bigger than Yamamoto. Of course there is far more to a prospect than their offensive production, especially when it comes to undersized players. They often get the stigma of being a one-dimensional player that has trouble with other aspects of their game because of a lack of size and strength – that stigma should not be present when analyzing Yamamoto’s game. While he certainly does need to get stronger – as is the case with 95% of 18-year old prospects – Yamamoto’s all-around game does not suffer. For context, here is a look at Yamamoto’s GF% relative to his teammates compared to other forward prospects ranked as first round picks. There are those that will dismiss GF% outright as a relative tool, I believe that using it as a benchmark (especially when relative to teammates) is a lot more relevant when analyzing junior players than it is with NHLers. Comparing prospects across a number of different leagues is difficult, but at the very least GF%Rel give you a grasp on how important a player is to his team’s all-around performance. Maybe it’s lazy to compare him to Gaudreau, Arvidsson or Brayden Point, but that’s how good he is – if anything it’s lazy to assume a player with elite skill should be downgraded as a prospect because he’s small. In this year’s draft Yamamoto is a top-10 talent that almost certainly won’t be drafted in the top-10. While it’s true not every small player that produces in junior can transition to the NHL, Yamamoto almost certainly will. He plays a style that is conducive to success in the NHL. It’s safe to assume that there are teams kicking themselves for passing on Alex DeBrincat last season because of his size – I’m willing to bet there are some that haven’t learned their lesson. Kailer Yamamoto is going to get drafted lower than he should.